My kids are both in middle school, and you know what that means. It’s the relationship drama that is hard. The friendship drama. The drama that comes when children have feeeeelings, and those feelings get in the way of interacting peacefully with others. The jealousy. The meanness. The insecurity. The alienation. The misunderstanding. It’s hard. Even though there haven't been many yet, it’s hard to hear the stories, because they were mine at one time. I remember thinking: my friend said this. My friend did that. My friend passed me in the hall and didn’t say hi. My friend sat with someone else at lunch. I remember the feelings of despair, of worry, of fear. What is happening? I don’t want to lose this friendship. What if nobody likes me? As a modern parent my children share their troubles with me. I have created these people who come to me for answers, and I can’t bring myself to dismiss them. I know the hurts and the confusion. I cannot just say You’re on your own, Drama Mama, a line my daughter picked up from TV when she was five. If my children come to me with their drama, I want to fix it. I want to change it. I want to take care of it. I want to share my knowledge, tell them how to handle it. After all, it’s easy from my side. Most of the time, their drama isn’t drama at all. It’s just something for them to talk about. They are learning how to distinguish between right and wrong. They are figuring out that people are different from them in their beliefs and behaviors. They are learning peace-making, how to explain themselves, how to communicate better. They are finding their spot in the world. If I tell them what to do, where to stand, and how to say everything, then how much of their handling of life is me, and how much is them? I want each of them to be able to make good decisions without my input. 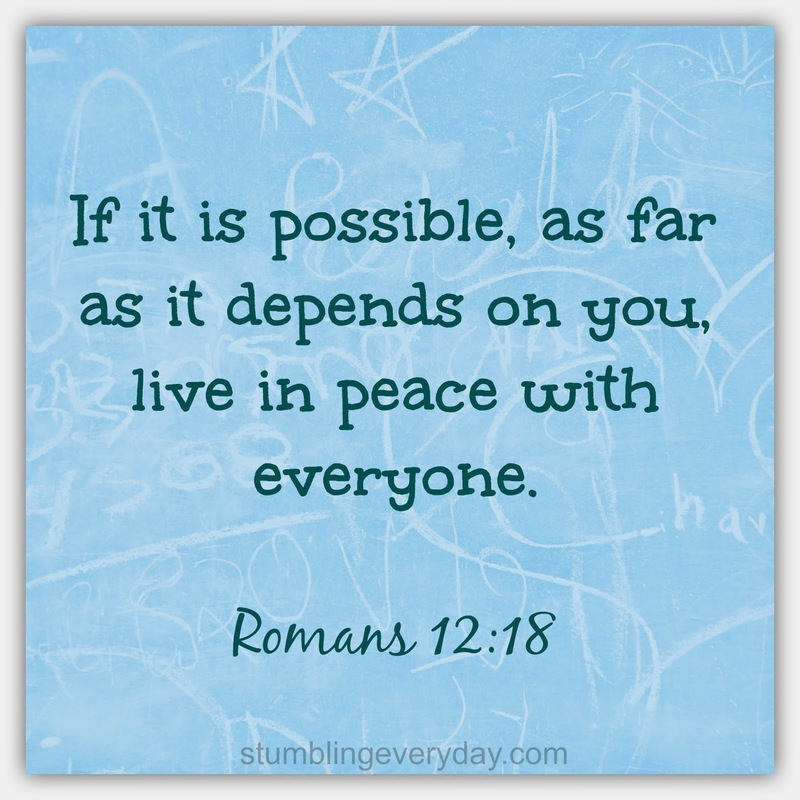 Romans 12:18 is one of my favorite Bible verses: If it is possible, as far as it depends on you, live in peace with everyone. Short, easy to remember, simple message. Live in peace with everyone, as much as you can. Of course, life is messier than this implies. This line doesn’t give you instructions about what to do if a friend wrongs you. Nor does it tell you how to correct things if you wrong someone unintentionally (or, in the case of my middle schoolers sometimes, intentionally. I never said my kids were always unwitting participants in any sort of drama). We can ask for help, but ultimately we have to figure it out for ourselves. Life is a swinging pendulum of elation and despair, hopeful beginnings and abrupt endings, encouraging words and harsh dismissals. Through it all, we have to deal. I pray that God will back me up on teaching my kids how to deal with their drama. He knows my children way better than I ever will, and I am thankful that they are in his hands. I can encourage them to keep bringing their troubles to me, and I can teach them what I know, but they are different from me. They need to know that I don’t always have all the answers, but God does. I am grateful that I can teach them this, that they can pray for guidance, for the right words to say, and for peace in their hearts when they go through the drama. During middle school, for sure, but also for the rest of their lives. I'm right there with you, Andrea, as the parent of an 8th grader. When she comes home hurt and sad, I struggle. I want so badly to fix every problem but I know that is not possible. I can listen and advise, but I know that she must learn to solve her own interpersonal problems. That's not saying that I have never interfered in her business; I have, but I usually regret it. I like the verse you quote. I like the part, "...as far as it depends on you," because it reminds us that we can't control how other people act. You can be the most easygoing person in the world and some people will have issues with you. That's just life, unfortunately. Thanks so much, Cary. It's a hard lesson for us, to hold back from fixing all their problems, isn't it? We go from wiping noses to watching them navigate the complexities of life on their own in the blink of an eye. The part of the verse you quoted is my favorite part of it, too. It reminds me that I have an out - that I am not responsible for anyone but myself. Makes life much simpler. Hi! I'm Andrea. Click on my picture to know more.